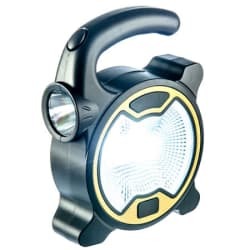 As one of its daily deals, 13 Deals offers the SE COB LED 2-in-1 Portable Work Light for $5.99 with free shipping. That's tied with yesterday's mention at $12 off list and the best price we could find. This push-activated lamp features a 60-lumen LED side light and 160-lumen COB front light. Deal ends today. Note: Stocking up? Order two for $9.98, or ten or more for $3.99 each.